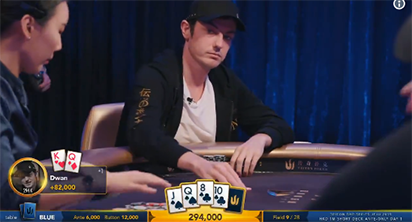 Tom Durrrr Dwan has been exciting the fans with his usual pack of tricks, playing agressively in a Short Deck event at the Triton Poker Jeju. Durrrr made a solid impression and had few very interesting hands, one where he got called on his bluff straight away - you must see his reaction in the second movie. Second hand, he wasn't that lucky! Dwan was heads up against Malaysian star Ivan Leow and players manage to get to the river. Durrr is holding on a board, where Leow decides he still has the best hand with after the turn went check-check.